Home » Blog » Is That Dragon Beginning to Look Like a Platypus? Is That Dragon Beginning to Look Like a Platypus? Tattoos are the realm of youth, much like roller coasters, extreme skiing, and mosh pits. Like many things that seem a good idea when young, not many people getting a tattoo contemplate the future of their skin…and the tattoo. Funny how that dragon running across your shoulder and down your arm is starting to resemble something else. Maybe a duck-billed platypus? Yes, aging waits for no one. Everyone’s skin becomes saggy and loose. Everyone loses collagen production, the skin’s support system, by one additional percentage point each year. And weight gain exacerbates the process, stretching the skin and underlying tissues. With 40% of the country now being obese, there are many, many tattoos that don’t quite look as they did when they were inked in. Not to worry — let the team at Northcoast Laser zap that unwanted ink away. Removing tattoos used to be a pretty difficult, and painful, process. 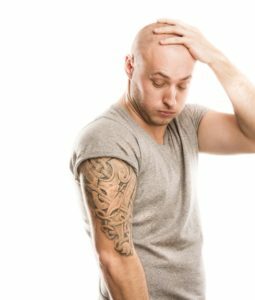 A person with “Annie” inked on his biceps who wanted to remove it because he married “Susie” could have the tattoo surgically removed, literally cut out. Or he could have it sandblasted off. The scarring that resulted was as noticeable as the tattoo had been. But lasers have changed that. Our lasers deliver a quick, high-energy pulse that is absorbed by the pigment in the tattoo. The energy breaks the pigment into particles small enough that they can be efficiently removed by the body’s lymphatic system. This is where things get a little tricky. Different colors absorb the laser energy better than others. For instance, black is easy while green, not so much. Also, some tattoos are placed more deeply in the skin than others. Ink composition and the age of the tattoo also come into play. Colors that play well with the laser are black, red, dark orange, and dark blue. Green, purple, brown, light orange, and light blue take more time. Most tattoos require a number of treatments spaced 6-8 weeks apart. Bottom line? Removing that Angel of Death will require anywhere from 3 to 13 laser treatments. If you have lost the love for that tattoo, let us take it off. Call us at 440-NEW-FACE to schedule an appointment.